Hello! 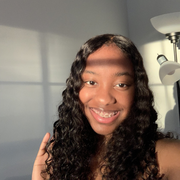 My name is Jada, I am 18 years old and I am a student at Georgia State University perimeter campus In Dunwoody! I am majoring in occupational therapy for children with autism. I simply enjoy spending time with children! Last summer I worked as a day time camp counselor at the YMCA with children ages 5 to 13. I am also CPR certified. I understand the importance of my role, and I'm willing to take on that responsibility. My references are by request. Thank you!